If you have chickens, you need these two books. Great, easy reading full of chicken know-how. A package deal on our two best books on everything chicken. 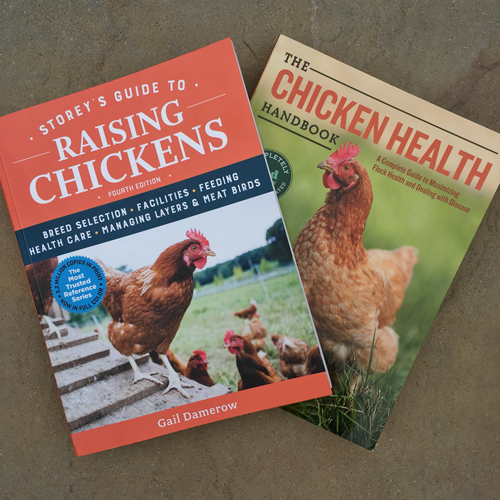 Whether you're new to raising chickens, or you have years of experience under your belt, this two-book bundle is a must-have reference set. Written by the leading expert on all things chicken, Gail Damerow, this bundle has everything you need to know to keep your flock healthy and safe. Storey's Guide to Raising Chickens, Fourth Edition, contains up-to-date information on care, shelter, food, health, and more. The Chicken Health Handbook is a complete reference offering expert guidance on nutrition, reproductive issues, and a full range of health issues. Both books include full-color photographs and instructive illustrations.